An historic headland on the north side of Sydney Harbour, a place of Aboriginal habitation, and later strategic for the defence of the harbour from maritime attack from as early as the Napoleanic wars in 1801. On land taken over for military installations won back in 2001 for the benefit of the ‘people of Australia’ in the charge of the Sydney Harbour Federation Trust. “…. 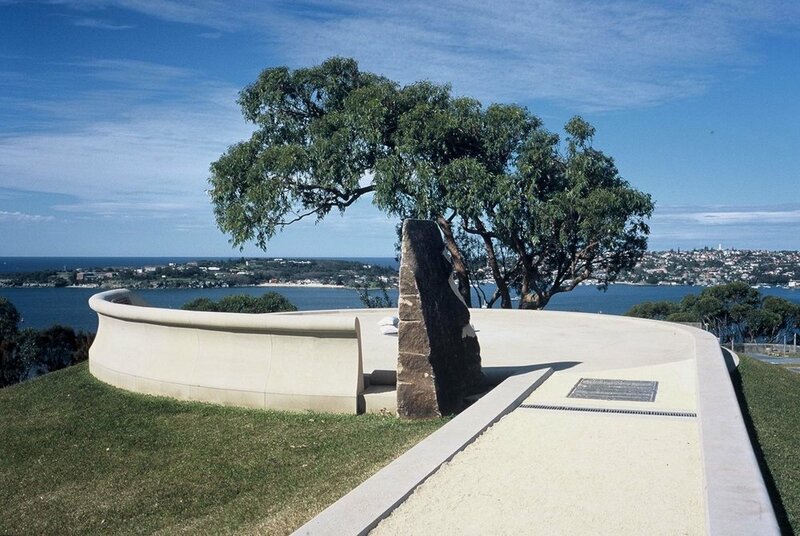 appreciation of the fortifications and the site’s relationship to … Sydney Harbour … the proposed lookout will … facilitate this appreciation … the lookout has been designed to interpret the form of the merlons which were originally part of the fortifications…. will provide a focal point for enhancing the community’s understanding of the history of the site to convey the evolution of all of the elements that comprise the fortifications on Georges Head and the relationship between these elements and the harbour … at a spectacular location that may have also been a significant place for Aboriginal people … visually dominant .. the domed headland with the geometric incisions in the rock ledge … it is proposed … a lookout and ceremonial area … the concept design for this is being prepared by architect Richard Leplastrier … a mounded form that melds sympathetically with the dome of the rock promontory … elevation of the lookout will enable safe access and viewing over the fortifications and the harbour without the need for safety rails around the fortifications … avoid any interference to the line of sight and avoid any adverse visual impacts on the harbour landscape … this area could also accommodate ceremonies and functions at the culmination of a processional route that includes the present roadway above the … cutting.”(Sydney Harbour Federation Trust, Georges Head Management Plan, 2004-5). A sensitive, beautifully crafted and understated intervention in this commanding location, it works with the landscape and the history. The detail of the curved sandstone wall seat, the bronze brackets and curved timbers, the geometry of the oblique steps, all enhance the experience of the visitor of the immediate surroundings and the spectacular views of the city, the harbour and its headlands.